For Menstrual Hygiene Day, 28th May 2016, Menstrupedia is trying to build World’s First Period Positive Poster Collective to make people talk about and think about periods all month. We believe its time we embrace our menstrual cycles as our own, a part of our beautiful bodies and talk about them in a positive light. This #MHDay show your beloved uterus some love and join us in building a collection of period positive posters – quirky, bold and out there for everyone to see. 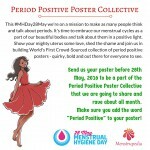 Send us your poster with the message of “Period Positive” to write@menstrupedia.com before 28th May, 2016 to add it to the Period Positive Poster Collective. We are going to share and rave about on all our social media and web channels all through the month. Let’s paint the world Red this May!